WASHINGTON -- When Imre Jánosi's teenage daughter asked him how her new lava lamp worked, she probably expected a quick explanation. But her innocent question sent Jánosi, a physicist at Loránd Eötvös University in Budapest, on an experimental quest to plumb the physics of the popular novelty toy. "I wanted to find something, an easy explanation for what happens inside," Jánosi explained. "So I started to check the web and the professional literature, and that was a real surprise. There was practically no useful information, nothing about the physics." Jánosi knew the basics, of course; a lava lamp operates on the principle of convection. The chamber is filled with water (sometimes mixed with additives) and a wax-like substance. Initially, the wax is denser than the water, and settles at the bottom of the lamp. A light bulb heats up the wax until it's less dense than the surrounding liquid. It then rises to the top, cools, and falls back to the bottom. But Jánosi considered this to be a vague, hand-waving explanation at best. He wanted to know the details. He also had a scientific motivation; Jánosi works in the von Karman Laboratory of Environmental Flow in Hungary, which uses small-scale experiments to study the behavior of fluids in the atmosphere, oceans, and deep inside the Earth. Teachers and even scientists often compare the lava lamp's undulations to the slow convection in the Earth's mantle, and Jánosi wondered if it was truly a good analogy. While blobs form and distend erratically in a commercial lava lamp, Jánosi's flowed like clockwork. The silicon on the bottom heated up until it formed a blob that floated to the top. As it cooled, the blob dropped back to the bottom. The lamp could run for two weeks without stopping, while Jánosi and Gyüre studied its behavior at different temperatures. 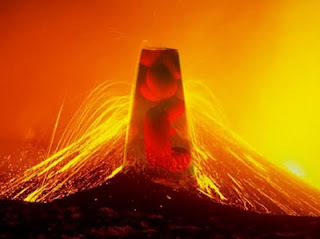 Earth's inner mantle consists of hot, flowing rock that circulates extremely slowly, and is often explained by analogy to the flow in a lava lamp. But Jánosi found that there are some key differences. The wax in a lava lamp is more viscous than water, meaning it flows less easily. However, Jánosi said, "Hot plumes that are rising up in the liquid mantle ... are at least 100 times lower in viscosity than the surroundings." To help him explain the lava lamp's workings to his daughter, Jánosi's paper will be published in the journal Physical Review E.
But his scientific love affair with the toy is far from over. By tinkering with his lava lamp's ingredients, Jánosi may be able to bottle the mantle's physics. "If we could come up with an analogy for mantle convection ... that would be a great step," he said.